Operating fire and emergency services is an expensive endeavor, even with the tremendous cost savings volunteer members provide. Any contributions help. The Wexford Volunteer Fire Company is a 501c(3) organization, so your contributions are tax deductible. Contributions from the Township of Pine for our general fund budget. A state relief fund for gear and equipment. A fund drive for donations from residents and businesses of Pine. The Township contributions and state relief fund are a huge help, but donations are also a large portion of our annual budgeted revenue at 20 percent. $10,000 Average cost to equip a firefighter in full gear including breathing apparatus and portable radio. It's staggering to think that when you see firefighters in full gear, you're looking at that much of a financial investment in just personal safety equipment for one firefighter. The first mailing goes out in late winter/early spring. Submit your donation in the return envelope. The mailing address on the return is different than our station address because your check goes directly to the bank into our fund drive account. There is no need to readdress to our main station. A second mailing goes out in early summer to addresses we’ve not received a donation from. If you donate and receive a second mailing, it’s most likely because your contribution was received around the time that the second mailing was sent. If you have any questions about the status of your donation, feel free to contact us at 724-935-1491. Does your employer participate in a Matching Gifts Program like the United Way? We get donations through this method as well, and appreciate the support. See your employer for more information. Donate securely online. Amazon Smile will donate a portion of your purchases directly to Wexford VFD. You can also make a direct contribution through PayPal; no PayPal account is required. We operate out of three stations, two of which are facilities owned by us. Stations are located on North Chapel Drive in Wexford, Babcock Boulevard in Gibsonia, and at the Pine Municipal Building on Pearce Mill Road in Wexford. The fleet consists of 10 vehicles including three fire engines, one tower ladder, one rescue truck, one tanker, one brush truck, two pick-up truck squads, and one command vehicle. We also operate a trailer with traffic control equipment, and an ATV with a pump and water tank. 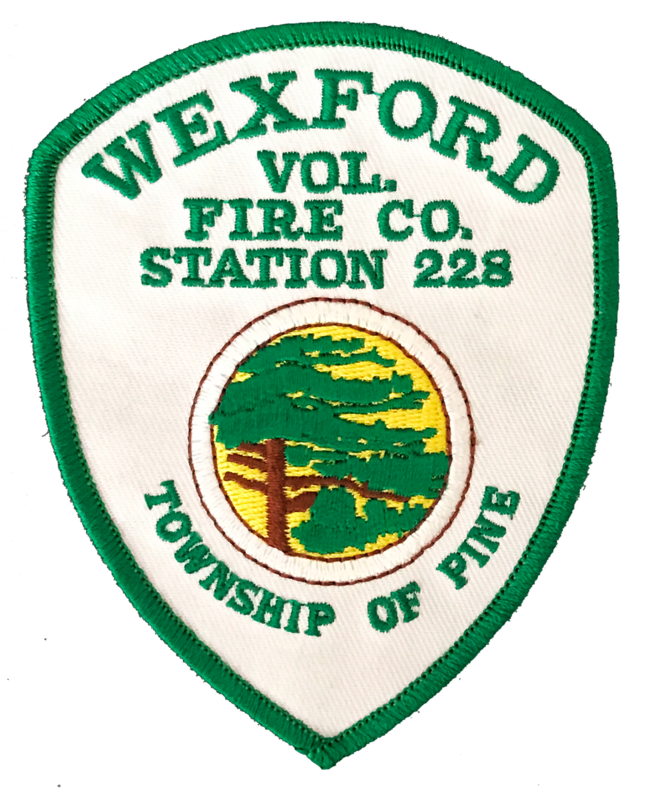 The Wexford Volunteer Fire Company is the only fire servive provider for the Township of Pine. We cover Pine’s 17 sqaure miles, with a population of around 14,000 residents. We also provide regular automatic and mutual aid with neighboring communities. In addition to fire responses, we respond to vehicle crashes, Carbon Monoxide Alarms, gas leaks, downed power lines, and much more. Our call volume has been averaging just over 400 calls per year, and has seen a steady increase over the past decade with the rapid development in the area. It takes a lot to become a firefighter, and then maintain the necessary skills. New members working towards certification as a structural firefighter will spend over 180 hours in training. The average member spends about 40 hours in training and drills each year. Weekly training and drills are offered in house each Tuesday evening, and sometimes on other days of the week. Members are also able to take advantage of formal training and education at local fire academies, training conferences, the state fire academy, and through many other resources. Hundreds of area kids are impacted through fire safety programs. Our members do school visits, station tours, and many kinds of community events. If you’re interested in having a station tour, or a fire truck visit your community event, see our Community Page for more information.